Coriander or cilantro is a wonderful source of dietary fiber, manganese, iron and magnesium as well. 1. Cleans your kidneys – coriander leaves contain powerful detoxifying abilities. They bind to the heavy metals in the bloodstream and thus purify blood, tissues and organs. This process occurs because the leaves possess biochemical content: phytic acid, citric acid and amphoteric electrolytes. The leaves not only improvise digestion but also inhibit the formation of free radicals. The leaves contain all chelating agents: vitamins and minerals. This property of coriander leaves make it best to use for prevention from Alzheimer’s disease, cancer and diabetes. They are a natural diuretic and thus act a natural balancer for sugar levels. They are a great source of kidney detoxification, as they help in salt elimination from kidneys and free the body from the load of poisonous heavy metals like lead, cadmium and mercury. 2. Clears up skin – the leaves are disinfectant, antifungal, detoxifying, antioxidant and antiseptic. All these properties are enough for clearing up any skin disorder. 3.Treats diarrhea – essential oils of coriander contain Linalool and Borneol, both of which aid in proper liver functioning and improving digestion, thus help in reducing diarrhea. Diarrhea caused by fungal and microbial actions can be cured with coriander essential oils, as they possess antibacterial properties. 4. Clears mouth ulcers and freshens breath – coriander contains a potent antiseptic called citronelol. It also contains many components that have antibacterial and healing properties. All these stop mouth ulcers to worsen, speed up the healing process and freshens the breath. Coriander is one of the ingredients in all antiseptic toothpastes. 5. Lowers cholesterol – coriander contains various acids, including linoleic acid, palmitic acid, ascorbic acid, oleic acid and stearic acid. All these acids are very useful in reducing cholesterol levels in the bloodstream, especially the bad cholesterol. Thus, it helps in prevention from strokes and cardiovascular diseases. Another important benefit is that it also helps in increasing the good cholesterol levels, which works as a protective layer against a number of dangerous conditions. 6. Lowers blood pressure (BP) – for people suffering from hypertension, consuming coriander is a boon. It greatly helps in reducing the BP by making the coriander’s calcium ions and nervous system’s neurotransmitter (cholinergic) interact with each other; this interaction helps in relaxing the blood vessel tension. In turn, risk of having strokes and heart attacks reduce significantly. 7. 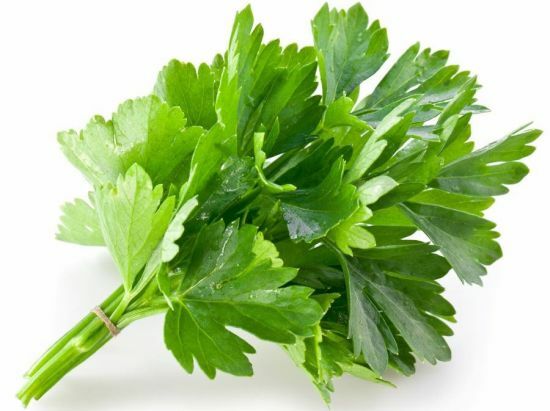 Kicks off anemia – high iron content of coriander makes it worth including in the food. High iron in the blood helps in proper cognitive functions, alleviates symptoms of breath shortness, provides more energy and strength, and promotes bones health. 8. Anti-allergic – anti-histamine properties of coriander helps in reducing uncomfortable affects and symptoms of seasonal allergies and fever. 9. Promotes bone health – rich source of calcium, coriander leaves are known to protect the bone integrity. Bone durability and regrowth can be stored easily by coriander, as it is rich in calcium and other important minerals. It also protects from bone degradation. Include coriander in your daily food items to maintain your bone health. 10. Protects eyes – coriander is rich in minerals like phosphorus, vitamins A and C, and antioxidants, all of which help in prevention of vision disorders, reduces stress on the eye and macular degeneration (age-related disorder). Coriander leaves are rich in b-carotene, which is useful in reversing the vision degradation effects in aging patients. Stimulates digestion – rich aroma of coriander essential oils triggers both digestive and secretive enzymes, thereby promoting better peristaltic motion and digestion. It possesses stimulatory qualities. Disorders like indigestion (dyspepsia) and anorexia (sleeping disorder) can be cured by regular consumption of the leaves in the diet. 11. Improve memory-One study in 2011 found that memory deficits in mice could be reversed by the addition of coriander leaves to the diet for 45 days. With more research, coriander could have a role in managing conditions like Alzheimer’s disease. While larger trials on human subjects are needed to further understand the many potential coriander health benefits, this plant has some remarkable capabilities for improving your health. The leaves, stems, roots, and seeds of the plant all offer some benefit, so try adding fresh cilantro, whole coriander seeds, and coriander powder to your cooking. For the most potent form, you can purchase coriander oil, and add a few drops to a glass of water or a smoothie, or put them straight under your tongue for efficient absorption. 12. Stimulates digestion – rich aroma of coriander essential oils triggers both digestive and secretive enzymes, thereby promoting better peristaltic motion and digestion. It possesses stimulatory qualities. Disorders like indigestion (dyspepsia) and anorexia (sleeping disorder) can be cured by regular consumption of the leaves in the diet.